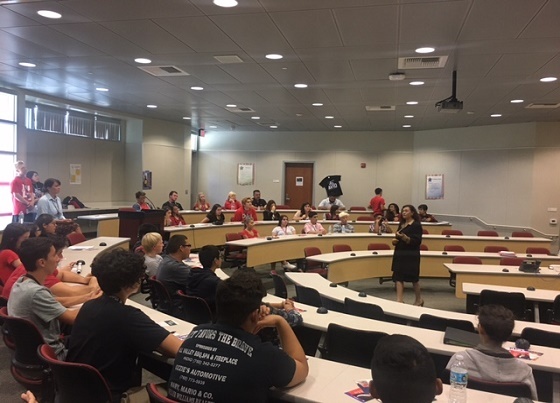 Indio, CA: The Greater Coachella Valley Chamber of Commerce hosted their first Future Leaders Program Candidates Forum at Shadow Hills High School last week. All seven candidates for Indio City Council participated in the event that was moderated entirely by students. In addition to the Chamber’s Future Leader Program, kids from AVID and other clubs were also invited to join the forum, giving many kids in the high school their first taste of an election event. “This was a great event” said Jackie Lopez, a candidate for City Council and participant. “It is great to see the future of our city be able to engage in the process.” The students worked with their counselors to formulate questions in advance of the event. The candidates were presented with a range of questions addressing issues such as the future of the Indio Mall and more events for youths in the city. Participants included Mayor Glenn Miller, Council Member Lupe Ramos Watson, Joan Dzuro, Jackie Lopez, Sam Torres, Noe Gutierrez, and Gina Chapa.